THIS IS THE FIFTH PAGE of the M-DOCS (Miscellaneous Documents) pages, covering the month of July 1927. The page is in progress. 1. July 1, 1927. "Concrete Results in Trade Extension Work" (Year Ended June 30, 1927), US Consul A. J. McConnico, p. 1. "Consular Regulations, Paragraph No. 601(d). ¶ CONCRETE RESULTS IN TRADE EXTENSION WORK. ¶ (Year ended June 30, 1927) ¶ (No. 180.) ¶ Consul A. J. McConnico, ¶ Bluefields, Nicaragua. ¶ Date of preparation: July 8, 1927. ¶ Date of mailing: July 8, 1927. ¶ DEPENDENCE UPON THE UNITED STATES. ¶ The Bluefields Consular District is dependent upon the United States commercially. All of its exports consisting of bananas, mahogany and cedar, gold and silver, coconuts and turtles, valued at $3,000,000 annually, are absorbed by the United States. Fully 85 per cent. of its imports, valued at more than $2,000,000 annually, are of American origin or manufacture. ¶ The district produces no manufactured goods, nor food products in sufficient quantities to meet the limited demand of its population of 50,000. It is compelled therefore to seek all varieties of manufactured goods and most of its food products elsewhere. Its only steamer connection is with the United States, and in consequence of long association, it deals almost exclusively with the United States in purchasing its supplies. ¶ AMERICANS […]"
2. July 1, 1927. "Concrete Results in Trade Extension Work" (Year Ended June 30, 1927), US Consul A. J. McConnico, p. 2. "[...] AMERICANS CONTROL LARGER INTERESTS. ¶ Americans control the banana, the mahogany, and the mining industries, maintaining their headquarters in the United States. Americans control the import trade, the leading commission merchants being Americans, and even the principal retail merchants, mainly Chinese, maintain American connections and banking accounts in the United States. In fact, the economic life of the district is dependent upon Americans. ¶ Six American firms of Bluefields represent 35 American exporters; and three of the foreign firms, six more American exporters. Furthermore, the two mining companies, the five mahogany companies, and the two banana companies, whose operations really serve as a basis of the economic life of the district, have their headquarters in the United States and purchase the larger proportion of their supplies through their home offices. ¶ CONSULAR EFFORTS. [...]"
3. July 1, 1927. "Concrete Results in Trade Extension Work" (Year Ended June 30, 1927), US Consul A. J. McConnico, p. 3. "[...] CONSULAR EFFORTS. ¶ With such American control and rivalry consular efforts cannot be credited with much success. Although 109 replies to trade inquiries were written during the fiscal year ended June 30, 1927, it cannot be said that this office aided materially in the promotion of American trade. The situation was rather critical throughout the year, owing to revolutionary disturbances, trade conditions at no time being normal. Nevertheless, the representatives of the 41 American exporters were alert and took advantage of every opportunity to satisfy the limited demands. ¶ There were no trade opportunities during the year; no trade disputes, nor cases involving trade protection; no cases of governmental contracts and concessions upon which to base reports; no construction work nor extension of transportation facilities except that of the Bragmans Bluff Lumber Company at Puerto Cabezas (which was carried on amidst difficulties incident to the revolution); and no reconstruction and development enterprises. In fact, it was a year of business inactivity verging on stagnation, a continuation of which for a few more months would have resulted in economic disaster. ¶ File No. 610." 1. July 13, 1927. "Trade Promotion Work at Bluefields, Nicaragua," US Consul A. J. McConnico, p. 1. "(General Instruction, Consular, No. 289.) ¶ TRADE PROMOTION WORK AT BLUEFIELDS, NICARAGUA. ¶ (No. 181.) ¶ Consul A. J. McConnico, ¶ Bluefields, Nicaragua. ¶ Date of preparation: July 13, 1927. ¶ Date of mailing: July 13, 1927. ¶ TRADE EXTENSION. ¶ The commercial and other work of the Bluefields Consulate is entirely under the control of the Consul. When trade inquiries and other letters are received they are classified by him and delivered to the clerk for record, after which they are returned to him for consideration. He either dictates replies to the clerk, or in some instances, writes the reply for the clerk to copy. His sources of information are based upon inquiries submitted to leading merchants and importers; upon the records of the consulate, reports of the Collector of Customs at El Bluff and the Collector General of Customs at Managua, and the Nicaraguan Customs Tariff. All correspondence, including trade letters, is signed by the Consul, there being no other officer to whom such authority could be delegated, the office force consisting of a consul and a clerk. ¶ According […]"
2. July 13, 1927. "Trade Promotion Work at Bluefields, Nicaragua," US Consul A. J. McConnico, p. 2. "[...] According to the records of the consulate, 24 American salesmen visited the consulate during the last calendar year, and to date. They constituted practically all of such representatives calling at Bluefields, some of them twice a year. Most of them were quite familiar with the district, having made trips to this section repeatedly. Their main purpose was to ascertain facts as to the political and economic situation. ¶ No Forms No. 244-Revised were issued during the calendar year or to date. There is but little traveling done by business men of this section. Those, who have gone, had a definite object in view; that is, to meet some business man of New Orleans in regard to a particular business matter. ¶ Sixty-eight World Trade Directory Reports were submitted during the fiscal year ended June 30, 1927. Efforts are made to keep them up to date by consulting the concerns upon whom reports are made, and by seeking information from the local bank and other reliable firms. ¶ Reports concerning concrete results of trade extension work have been forwarded to the Department annually at the end of each fiscal year. ¶ No American importers maintain main or branch offices in the district, but seven American exporters maintain branch offices. Five of them are mahogany companies; two, banana companies. The two banana companies operate commissaries and import large quantities of merchandise and food products. ¶ Six American firms of Bluefields represent 35 American exporters; and three other firms, six more American exporters. Some firms also have the exclusive representation of certain American exporters, thus preventing local competitors from handling goods of similar brand. ¶ No foreign […]"
3. July 13, 1927. "Trade Promotion Work at Bluefields, Nicaragua," US Consul A. J. McConnico, p. 3. "[...] No foreign manufacturers maintain offices in the district. One local commission house (R. Fransen and Company, Belgian) represents a number of European manufacturers. This firm also represents several American exporters. ¶ The practice of importers in the district is to purchase American merchandise on direct orders. Sometimes the orders are placed through local commission houses, especially for food stuffs, and at times through traveling representatives. ¶ No reports were submitted from this office during the last calendar year dealing with openings for American trade. There were no opportunities for promoting trade. Conditions were chaotic owing to hostilities and warlike activities most of the time. There was a strong demand for rifles, cannon, and other munitions of war, and the demand could have served as a real opening for the sale of such manufactures had not statecraft dictated measures prohibiting such imports. ¶ Foreign competition with American goods, except in a few particulars, is not very keen in this district. English threads and teas are sold almost exclusively, and preference is given to the finer grades of English dress goods (cotton and silk), cassimeres, linens, Victoria lawns, and nainsooks. English sweet biscuits, tinned and bottled preserves and meats are demanded in quantities. ¶ German blankets, hosiery, and enameled ware, Italian hats and cottonades, French dress goods (cotton and silk), ribbons, hosiery, and fancy foodstuffs in tins are preferred to similar American products. The average consumer contends that, for the price demanded, the foreign products mentioned are superior in quality or grade to those supplied by American exporters. ¶ Fully 85 per cent. […]"
4. July 13, 1927. "Trade Promotion Work at Bluefields, Nicaragua," US Consul A. J. McConnico, p. 4. "[...] Fully 85 per cent. of the imports into the district are of American origin or manufacture. The district produces no manufactured goods; nor food products in sufficient quantities to meet the demands of its population. It is compelled, therefore, to import all varieties of manufactured goods and most of its food products from abroad, the greater proportion from the United States. The annual and quarterly reports, and those on concrete results of trade extension contain sections relating to imports from other countries and the preference given to them, especially the supplemental annual reports based upon the annual reports of the Collector General of Customs. ¶ No countries enjoy preferential customs treatment in the district over the United States. France at one time did, but the preferential rate no longer obtains. Under a treaty with Honduras, certain Honduranean [Honduran] products enjoy a preferential rate, but the imports from Honduras are negligible, not affecting the larger exporting countries. The Department was no doubt informed years ago of the preferential rate enjoyed by Honduras. ¶ The local customs tariff is for the specific purpose of collecting revenue. There are no domestic industries to be protected. ¶ There is no prejudice in the district against American goods or American business methods. The fact that the only steamer connection of the district is with the United States tends to direct all trade to the United States. Importers realize that their orders can be filled more quickly, and really prefer American products that meet with a ready demand. Certain products, mentioned above, are imported from Europe owing to the local demand. In obtaining European products, owing to the fact that there is no direct steamer service, delays are frequent. ¶ The […]"
5. July 13, 1927. "Trade Promotion Work at Bluefields, Nicaragua," US Consul A. J. McConnico, p. 5. "[...] The principal imports from the United States are: Food products; staple cotton goods; machinery for saw mills, railways, sugar mills, mines and other classes of machinery and electrical appliances; paints and varnishes; oils, gasoline and kerosene; hardware and cutlery; drugs and chemicals; shoes and leather goods; paper and paper products. These constitute approximately 85 per cent. of the imports into the district and are valued at $2,000,000 annually. ¶ The exports from the district, all of which are absorbed by the United States are: Mahogany, cedar, bananas, gold and alloys, coconuts, rubber, turtles, silver, valued at approximately $3,000,000 annually. ¶ BANKING […]"
6. July 13, 1927. "Trade Promotion Work at Bluefields, Nicaragua," US Consul A. J. McConnico, p. 6. "[...] BANKING INSTITUTIONS. ¶ “The one banking institution of the district, a branch of Banco Nacional de Nicaragua with headquarters at Managua, is located at Bluefields. It buys and sells exchange on New York and New Orleans at one-fourth of one per cent., and makes collections for one-half of one per cent. The rate of interest usually demanded is 12 per cent., but higher rates varying from 18 to 24 per cent. are demanded by individuals. According to the estimate of the local bank, 300,000 cordobas and 100,000 American dollars are in circulation in the district.” (Annual Report for 1926, Page 6, forwarded to the Department on March 26, 1927.) ¶ The growing importance of Puerto Cabezas as a port and as a center for the importation and distribution of merchandise and the exportation of bananas and pine lumber warrants the establishment of a banking institution there. The large circulation of American currency in the district is due to the fact that the Bragmans Bluff Lumber Company at that port finds it necessary to import American currency to carry on its operations, there being no banking facilities in that section of the district. ¶ The banking facilities at Bluefields are sufficient, and trade conditions do not warrant the establishment of another institution. ¶ Information as to the lack of banking facilities at Puerto Cabezas was given in the following reports: Annual Report for 1925, forwarded March 31, 1926; Quarterly Report for March, 1926, forwarded April 13, 1926; and Quarterly Report for June, 1926, forwarded July 10, 1926. ¶ There are no local laws or regulations discriminating against American banks. As a matter of fact Banco Nacional de Nicaragua is dominated by American interests. ¶ TRANSPORTATION. [...]"
7. July 13, 1927. "Trade Promotion Work at Bluefields, Nicaragua," US Consul A. J. McConnico, p. 7. "[...] TRANSPORTATION. ¶ The Cuyamel Fruit Company maintains a weekly service between New Orleans and Bluefields, its ships calling at Cienfuegos, Cuba, on their southbound trips. Through this company practically all of the imports into Bluefields are transported. ¶ The Standard Fruit Company maintains a 15-day service between New Orleans and Puerto Cabezas, transporting such merchandise as is demanded at that port. ¶ These two companies are the only ones connecting the Bluefields Consular District with the outside world. They maintain their services primarily to return with cargoes of bananas to the United States, engaging in freight and passenger service from New Orleans as a mere side issue. Their ships are of Nicaraguan and Honduran registry. ¶ The Munson Line provided ships during the last mahogany season ended June 30, 1927, at such periods as demands were made for exporting mahogany and cedar logs. About 30 of this company’s ships called during the season, nine of them being of American registry, the others, English, Norwegian and Danish registry. This was rather unusual, for ships of American registry do not usually call at ports of eastern Nicaragua. Small coastal vessels of Panaman [Panamanian] and Honduran registry connect the Bluefields district with ports of Honduras, Costa Rica and Panama. ¶ It is not likely that an opportunity will be afforded for an increase of American participation in such transportation, when such companies as the Cuyamel Fruit Company, the Standard Fruit Company, and the Munson Line deliberately make use of ships of registry other than American. There are no foreign shipping combinations hostile to American participation in the carrying trade, but it appears that there is a concerted demand on the part of American interests controlling the export trade of the district to employ ships of foreign registry, possibly because the operation costs are less. ¶ The American […] "
8. July 13, 1927. "Trade Promotion Work at Bluefields, Nicaragua," US Consul A. J. McConnico, p. 8. "[...] The American ships, as well as the other ships of the Munson Line, arrived from such American ports as New York, Philadelphia, New Orleans, always in ballast, and returned with cargoes of mahogany and cedar to New York, New Orleans, and Philadelphia. During the past fiscal year the American proportion was about one-third; usually it is nothing. ¶ CHAMBERS OF COMMERCE. [...]"
9. July 13, 1927. "Trade Promotion Work at Bluefields, Nicaragua," US Consul A. J. McConnico, p. 9. "[...] CHAMBERS OF COMMERCE. ¶ There are no chambers of commerce, boards of trade, or similar organizations in the district. ¶ TRADE AND […]"
10. July 13, 1927. "Trade Promotion Work at Bluefields, Nicaragua," US Consul A. J. McConnico, p. 10. "[...] TRADE AND STATISTICAL PUBLICATIONS AND CATALOGUES. ¶ American trade and statistical newspapers, reviews, and catalogues are received and kept on file in a seperate [separate] room of the consulate, and are available to visitors. They are, however, seldom consulted, possibly five times within the past three years. The publications are made readily available to visitors for reference by being classified and segregated. Old issues are given to persons who may ask for them; merchants and others. ¶ PREPARATION OF […]"
11. July 13, 1927. "Trade Promotion Work at Bluefields, Nicaragua," US Consul A. J. McConnico, p. 11. "[...] PREPARATION OF REPORTS. ¶ In the preparation of reports and trade letters information is obtained from individuals and organizations. For instance, the Cuyamel Fruit Company’s manager is consulted in reference to matters pertaining to banana cultivation and exports; the managers of the mahogany companies, when information is desired regarding the mahogany industry. The same applies to gold mining and the production of coconuts, the managers of such concerns always being consulted. The only publications relied upon are the reports of the Collector General of Customs, there being no local publications supplying statistical information of commercial value or weight. When statistics and excerpts from reports of the Collector General of Customs are used they are accompanied with full and interpretative comment. ¶ TRADE COMPLAINTS. [...]"
12. July 13, 1927. "Trade Promotion Work at Bluefields, Nicaragua," US Consul A. J. McConnico, p. 12. "[...] TRADE COMPLAINTS. ¶ During the past calendar year, and to date, no complaints have been received at the consulate from any of the foreign merchants of Bluefields against American firms. No complaints have been submitted to the Department. ¶ During the past calendar year, and to date, three complaints have been brought to the attention of the consulate by American firms against foreign merchants. In one case, through the efforts of the consulate, the claim was adjusted; another case is being litigated; and a third was an outlawed claim, which no lawyer of Bluefields would undertake to collect. ¶ The consulate has therefore had but limited opportunity in using its services in the amicable settlement of trade disputes; and cannot assert that its efforts have resulted in increased prestige to American trade in the district. ¶ File No. 125.6." July 16, 1927. "Memorandum to the Commanding Officer, U.S. Marines, Estelí" on Interpreter Moses Mejía," 1st Lt. D. A. Stafford, Matagalpa. "58-DAS-wib ¶ HEADQUARTERS THIRD BATTALION FIFTH REGIMENT, ¶ SECOND BRIGADE, U.S. MARINE CORPS, MATAGALPA, NICARAGUA, ¶ 16 July, 1927. ¶ MEMORANDUM TO THE COMMANDING OFFICER, U.S. MARINES, ESTELI: ¶ Subject: Interpreter MOSES MEJIA. ¶ 1. The bearer, MOSES MEJIA, has been employed by the United States Government at Matagalpa, Nicaragua as an interpreter. His home is in Esteli, where he is at present looking after his personal affairs. He is faithful and honest and has rendered excellent service. 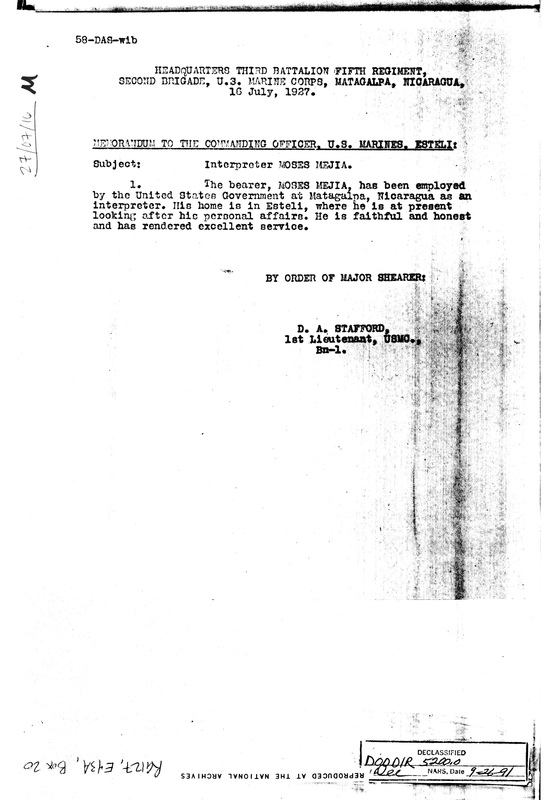 ¶ BY ORDER OF MAJOR SHEARER: ¶ D. A. STAFFORD, ¶ 1st Lieutenant, USMC., ¶ Bn-1."